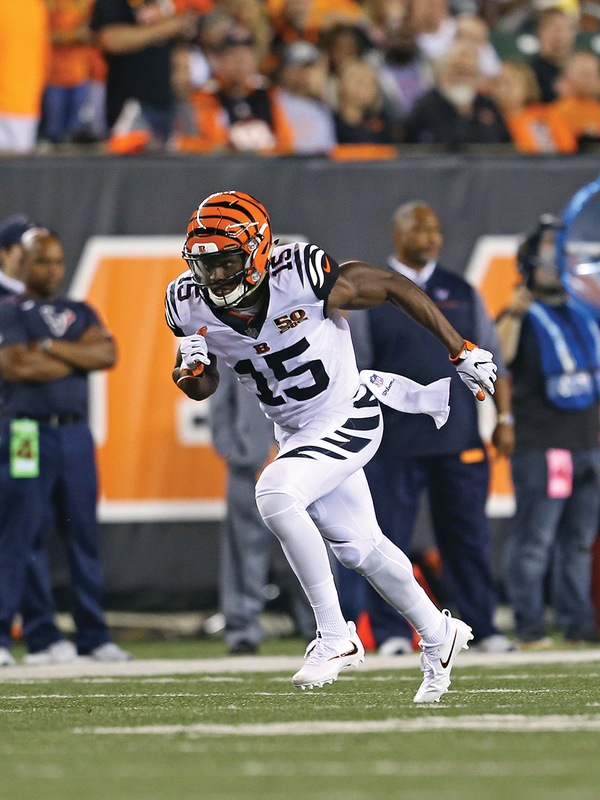 For Bengals receiver John Ross, an Amberley Village McMansion is just the right speed. It’s about 10 minutes until first pitch, but John Ross III is in no hurry. Doesn’t matter that the Bengals’ highly touted rookie wide receiver is the one throwing out a ceremonial first pitch at Great American Ball Park—he’s patiently perusing the wall of baseball caps in the Cincinnati Reds Team Shop just outside the ballpark. Here would be an opportune moment to insert a joke about the NFL’s fastest player taking his sweet time. Instead, Ross’s two roommates and high school buddies, Kamren Booker and D’Angelo Blake, offer more cutting takes. “This one makes you look bald,” quips Booker, as Ross tugs on the bill of one option. Trying on another, Blake wrinkles his nose and offers a placid “Nah.” When Ross finally makes a selection and heads for the checkout register, a security guard recognizes him and says hello, before glancing at her watch and mentioning that he better get moving. Hat on, Ross and his posse are quickly whisked into the bowels of the stadium by a Reds employee. Ross slips on his custom No. 15 Reds uniform and casually flicks the ceremonial baseball back and forth to himself. “Did he play baseball in high school?” I ask Booker, who chuckles and shakes his head no. A football star at the University of Washington, and just a few months removed from breaking the 40-yard dash record at the NFL Combine (4.22 seconds) and being taken with the Bengals’ ninth overall pick in the NFL Draft, Ross is no stranger to big moments. Still, he seems impressively calm for a 21-year-old just seconds away from throwing out the first pitch of a major league game—even if it is a lackluster, early-September crowd—in a new city, a few days before the Bengals season kicks off. The only hint of nervousness is when he takes the handler up on an offer to pop into the restroom before hitting the field. The National Anthem plays as he climbs out of the dugout and into foul territory (this is still a few weeks before President Trump will insert himself into that discussion), after which Ross is smiling and waving for the jumbotron, fresh new hat securely in place, then trotting out to the mound. No time for stretching or warm-up pitches, though it doesn’t seem to faze him. Reds speedster Billy Hamilton emerges to catch the throw—fastest player in football tossing to the fastest player in baseball, gold stars for corporate synergy—as Ross rears back and fires. The pitch skips in the dirt in front of home plate and slips past Hamilton. The fans offer polite applause as Ross smiles and takes it all in stride, dapping up his ceremonial catcher, You’re fast, I’m fast, we’re all fast. As if on cue, a young fan approaches, wide smile but sheepish, pen and paper in hand. “Sorry, but it’s hard to hide when you have a jersey with your name on the back, Mr. Ross,” the kid stutters. It sounds a bit rehearsed, as if recited to him by his parents. Ross laughs as he scrawls his name. The house itself is the embodiment of Ross’s current circumstance, merging from the humble-and-carefree-college-standout ramp onto the ballyhooed-NFL-prospect superhighway. There’s the finished basement, with a massive projection screen and billiards table adjacent to a bone-dry bar and Pop-A-Shot basketball hoop. The four-car garage that more often houses Bolt, a French bulldog, and Blaze, an Australian shepherd. The backyard replete with an in-ground pool, hot tub, and koi pond, just off the sprawling kitchen with bare countertops and an empty pantry. The living room, with a gorgeous cathedral ceiling above a floor littered with video game controllers, edged by the wall with a dent courtesy of Booker’s head. (“He was talking trash and it turned into some rough-housing,” Ross says with a shrug.) When the guys aren’t ordering from Marco’s—“They know us by name when we call,” according to Blake—they’re picking up food from Cheesecake Factory or Wingstop. “When he got here, John’s questions were, ‘Where are the bowling alleys?’ and ‘Where’s the closest amusement park?’” says James Urban, the Bengals wide receivers coach. 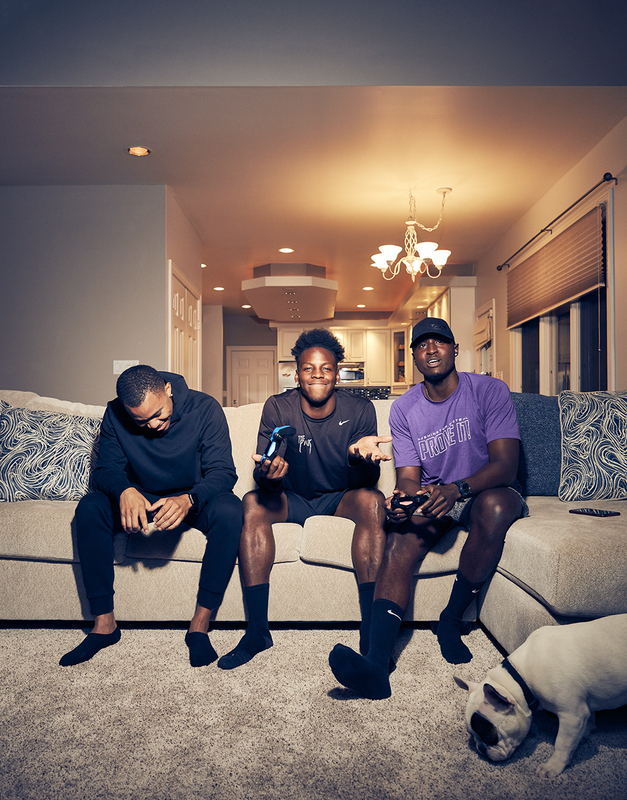 Playing video games with (from left) Kamren Booker, D’Angelo Blake, and Bolt. Juking guys was pretty standard too. “I was always the fast kid,” says Ross. The neighborhood kids would play kickball, football, and a playground game dubbed “throw-up tackle”; Ross was often smaller than the others, but they couldn’t catch him. As a 9-year-old, his athleticism caught the eye of Long Beach Pop Warner coach Calvin Broadus—better known as Snoop Dogg—who “recruited” Ross to play on his team for a few years. Receiver was never his natural position, though. Ross spent childhood playing running back, and wasn’t known for his hands when he got to high school. 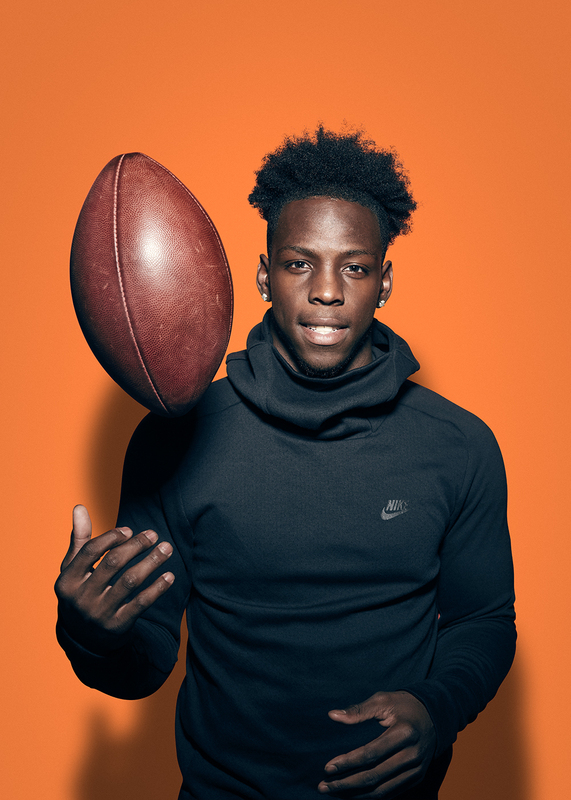 Booker tells a story from their sophomore season, when the coaches were working to develop Ross as a pass-catcher, and required that he haul in one long throw before each practice was officially over. “Sometimes it would take him eight or nine tries,” remembers Booker. Ross figured it out. By the next season, he was getting looks from major college programs, eventually committing to Washington. Gregory recalls how quickly and starkly things had changed during his own sophomore season, John’s senior year, when the two were playing on the same team and Gregory drilled his older brother with a crunching crackback block in practice, tweaking John’s ankle. “Our head coach told me if I wasn’t his little brother, he woulda cut me from the team,” says Gregory. Ross had come a long way from the small, skinny kid who couldn’t catch. In 2016, Ross racked up 18 touchdowns and Pac-12 Player of the Year honors at Washington, but what really put the shine on was the 40-yard dash record at the NFL Combine in March. The Bengals snatched him up with the ninth pick a few weeks later, desperate for some speed and explosiveness at the wideout position to pair with perennial Pro Bowler A.J. Green. The team was also charmed by Ross’s attitude and character, a narrative that was completely overshadowed by the second-round pick of running back Joe Mixon, who was suspended for an entire season in college for punching a female student in the face. Drafting Mixon garnered much of the attention and (deserved) objections from fans and media, but Ross’s reputation personified the polar opposite. None of that, however, guaranteed a smooth transition to the football field. When Ross joined the team this offseason after receiving his degree in American Ethnic Studies, he was still recovering from a lingering shoulder injury; once he worked his way back from that, he promptly picked up a knee injury in preseason that kept him sidelined for five of the team’s first six games. A Week 2 Thursday night matchup against the Houston Texans was the one he did play—national television audience, all eyes on him, social media trolls on notice. And on his first official touch as an NFL player, he took an end-around handoff and sped upfield, the turf a green blur beneath his feet—until a defender put his helmet square on the ball and forced a fumble that was scooped up by the Texans. Ross was benched the rest of the game. Even off the field, it’s been an interesting season to navigate, particularly as a rookie. In September, President Trump attacked players for kneeling during the National Anthem—a practice started by quarterback Colin Kaepernick in 2016 as a means to protest police violence against black people—and hijacked the issue into a divisive political discussion about patriotism. It led to coordinated team protests (the Bengals stood together with linked arms) and fraught statements from owners and government officials. For now, Ross prefers to focus on staying healthy and contributing to a Bengals squad that struggled mightily in the first half of the season. The high expectations and rocky start to his career have him motivated to get back up to speed and find a way to adapt. Again. He’s humbled but confident, taking comfort in things like the simplicity and stability of a quiet suburban house with a koi pond and Marco’s pizza and his two closest friends, where neighborhood kids come by to drop off cookies. It’s a baked-in support system—between the Super Smash Bros. throwdowns and rowdy games of Uno, Blake and Booker help Ross stretch and watch game film with him, make sure he gets to bed at a reasonable hour. Though even the suburban living has required some adjustments for the crew. Bolt and Blaze developed a recent habit of escaping through the backyard fence and exploring the subdivision—the guys all deem Bolt the real culprit, with Blaze just following along—relying on a few of those friendly neighbors to bring them back. One even offered the fellas an old-fashioned parental scolding. “He was kinda mad,” admits Blake.